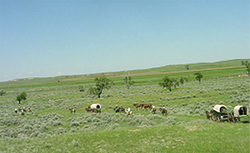 Enjoy the quiet wide open spaces of eastern Montana on our working ranch. Each season brings a different kind of work for those enjoying our ranch vacations. Our teams of Clydesdales pull the wagons for our wagon trains held throughout the summer. Our guest house provides a quiet relaxing place to stay overnight or for several days. If you enjoy hiking, bird watching or wildlife viewing, such as deer and antelope, you will enjoy our place. Also, the night skies are fantastic with viewing the constellations and northern lights being special treats. Bring your camera. For more information call (406) 557-2865. Directions: Sand Creek Clydesdales Ranch LLC lodging is located 7 miles east of Jordan, Montana on Highway 200. Traveling from the west look for mile marker 220; from the east mile marker 221. Our turn is to the south. Ranch is about 3 miles from highway.